Edward Ayers, Tucker Boatwright Professor of the Humanities and president emeritus at the University of Richmond, will be awarded the 2018 Gilder Lehrman Lincoln Prize for his work, "The Thin Light of Freedom: The Civil War and Emancipation in the Heart of America." Ayers will be recognized during an event hosted by Gettysburg College and the Gilder Lehrman Institute of American History April 26. In addition to a $50,000 prize, he will also receive a bronze replica of Augustus Saint-Gaudens’ life-size bust "Lincoln the Man." "As we have seen over the last year in Virginia and elsewhere, the Civil War and emancipation define a critical part of our nation’s history and future," said Ayers. "I’m grateful to the judges and organizations of the Lincoln Prize for honoring my unusual approach to a much written-about subject." 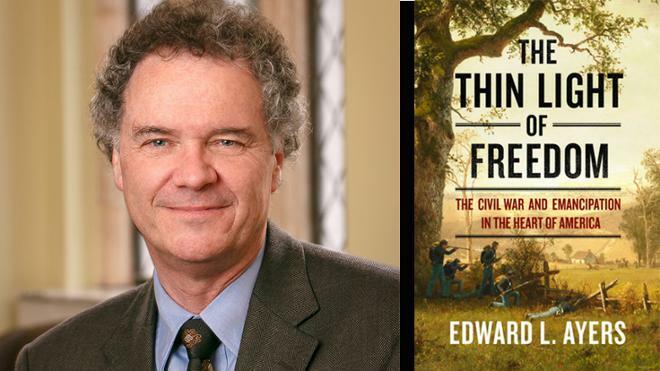 "Edward Ayers’s 'Thin Light of Freedom' makes the Civil War vividly, unforgettably real by focusing on ordinary communities, during the bloodiest crisis in American history," said James B. Basker, president of the Gilder Lehrman Institute of American History. "Both students of history and general readers will find this book exciting and enlightening."